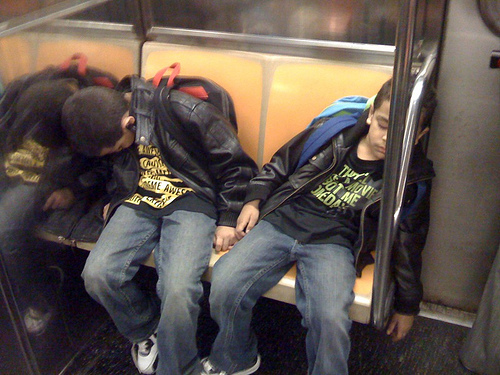 The big city may wear them out, but at least they'll keep their free MetroCards. Photo via shell belle. As school systems around the country start charging kids for their rides on the yellow school bus – or even cutting bus service altogether – a tentative deal worked out with state legislators in Albany reportedly will give the Metropolitan Transit Authority (MTA) $25 million to subsidize New York kids’ rides to school. The MTA’s school transportation program gives 300,000 New York City schoolchildren free passes to ride the subway or the bus to school, and 285,000 more receive reduced-fare cards. The MTA’s school transit program is really a huge bargain for the state – transporting far more students at a far lower cost than the Department of Education’s yellow school bus program. And the $25 million is less than 1/8 of the $214 million that the program costs. But it was enough to keep the MTA from scrapping the program altogether, as it thought it might be forced to in an attempt to redress this year’s $750 million deficit after the state lowered its contribution to just $6 million (from $45 million annually) in November 2009. Free rides for students can relieve low-income families of a huge financial burden while encouraging a culture of public transit ridership that kids will carry into adulthood. Few cities around the country give free rides to students; reduced-fare rides are much more common, particularly now that public transit systems are struggling across the country from state and city budget cuts. Boston, Mass. for instance, gives junior high and high school students a 50% discount on their T passes, while younger students ride for free with adults. Portland, Ore. however, offers a unique case of a new free student ridership program. Just under a year ago, Portland started letting high school students ride TriMet for free using a special TriMet student pass. In this case, the funding comes from Portland’s business energy tax credit, which gives tax credits to businesses that support transit solutions to reduce Oregonians annual 39 billion vehicle miles traveled (VMT). Roanoke, Va. also recently implemented a free pass for all students under 18 to ride the city’s buses. In this case, the city implemented the new free passes along with a 20% fare increase for other riders, which boosted revenue enough to pay for the “Students Ride Free” program. The idea for free rides came from the V.O.Y.C.E. (Valuing Our Youth through Community Engagement) initiative, which works toward creating a safer environment and more opportunities for low-income youth in Roanoke. The city also implemented the plan in the hopes that free rides will encourage a culture of bus-riding.